I’ve been playing in there all week long with an avalanche at my elbow. Use the Big Shot and I had a cascade of product falling all over the place. It was time to get that taken care of. I’m not leaving as I did the last time. All kinds of stuff piled on my table and the floor and come home to a mess. I would have grounded our kids, and have done, had they left their room in such a mess. Now I have the table top clear and the floor is clear so I can move around. It feels so good to get all the stuff put away. Declutters my mind as well as the table. I’m stepping out of my comfort zone and trying to get in touch with my “feminine” side. Flowers, ribbon, pearls, and feathers. Even some glitter. 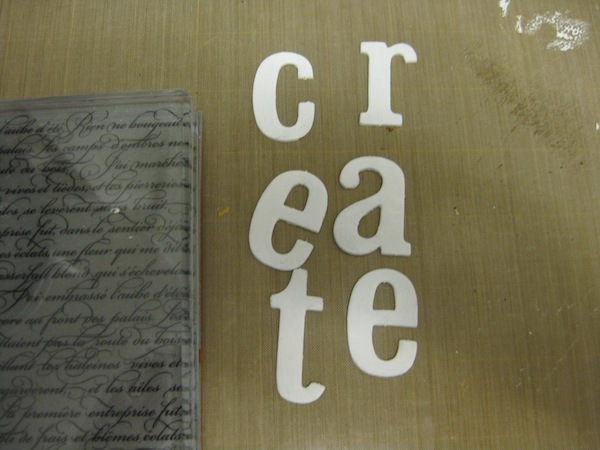 I am going to make a set of blocks that spell out “Create”. The paper I’ve chosen to cover the blocks with is a set from Stampin’ Up! that I purchased at the beginning of this year. Botanical Gazette. Since I no longer am a Demo I have no idea if this paper is still for sale or not. Just in case anyone is wondering. 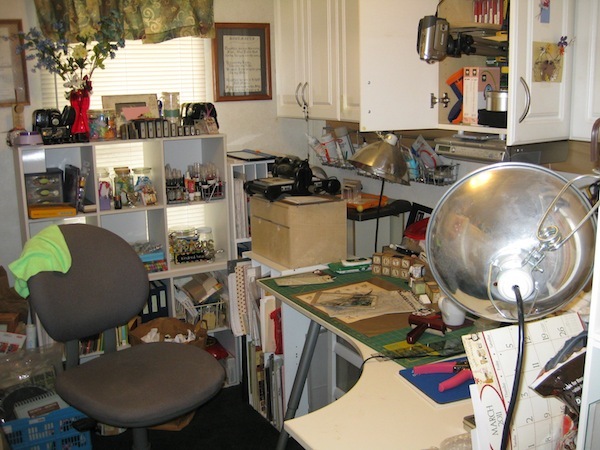 The reason I quit being a Demo for Stampin’ Up! is because of my truck driving job and the months that I spend on the road and totally out of the loop. I have no idea why I thought I could be a Demo in the first place but I gave it a whack. 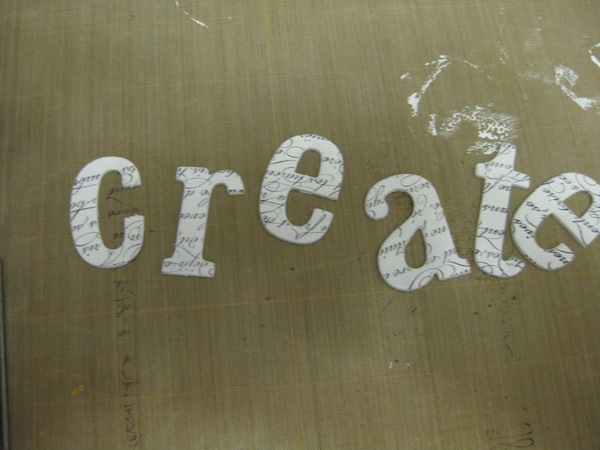 I have painted white acrylic paint on some chipboard letters. 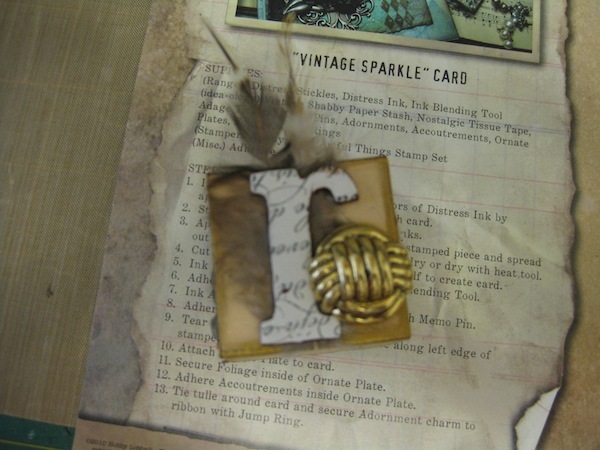 They are 1-1/2 inches tall and are from the Clearance Rack at Stampin’ Up! Again, I don’t know if they are still available or not. I felt they needed a little bit of something and decided to use the background stamp that is written in French. When I put the label on the stamp, I put it on upside down. So the image stamped on the letters is all upside down. Oh well, this is a trial run anyway. 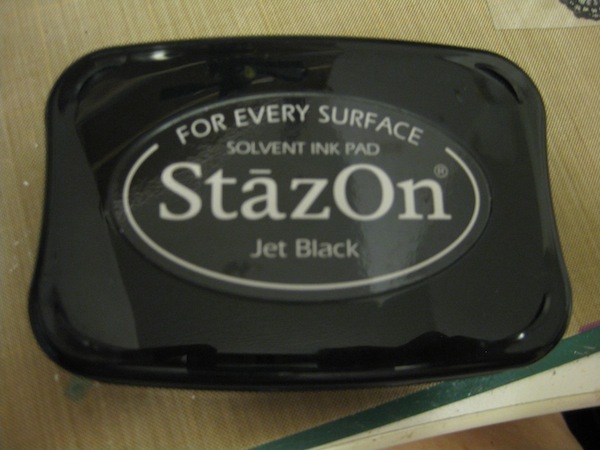 I’ve used black Staz On ink to stamp over the white acrylic paint. I’m not sure what a regular ink pad would have done but I didn’t want to chance it being rubbed off. I have two blocks finished. It is getting less scarey as I go along. With such a small area to cover I’m using techniques on things that I’ve never done before and some of the things are pretty daunting to me. Especially using the half back pearls. A ribbon tied around the letter “C” and a flower at the top begins the first block. Three turquoise glass beads in the corner to give a little contrast. 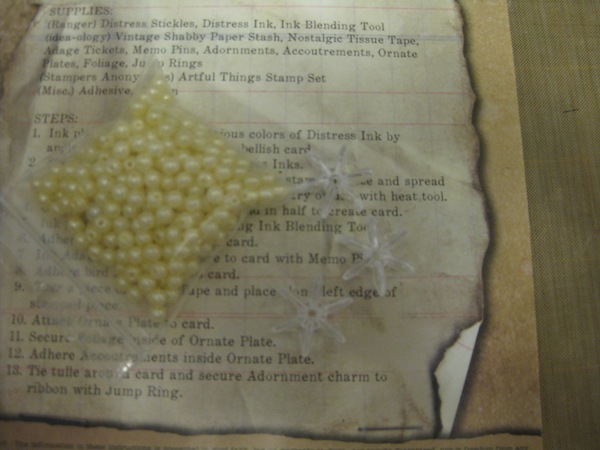 Some half back pearls and some ceramic roses are placed atop the paper covering the next side of the block. I added some Rub and Buff to the pearls to give them a bit more of a pop. Not sure if I like this or not. 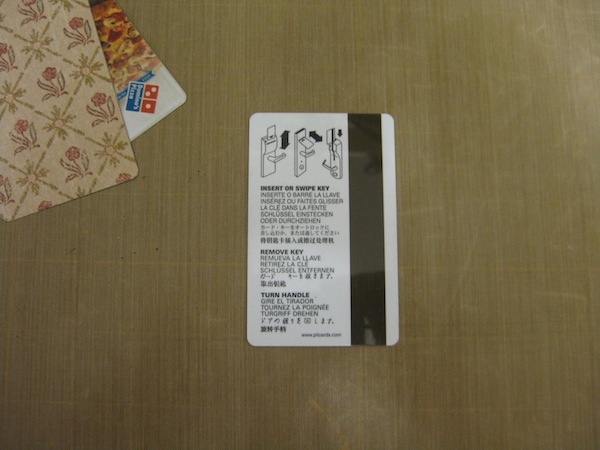 A small metal tag is on the next side of the block. 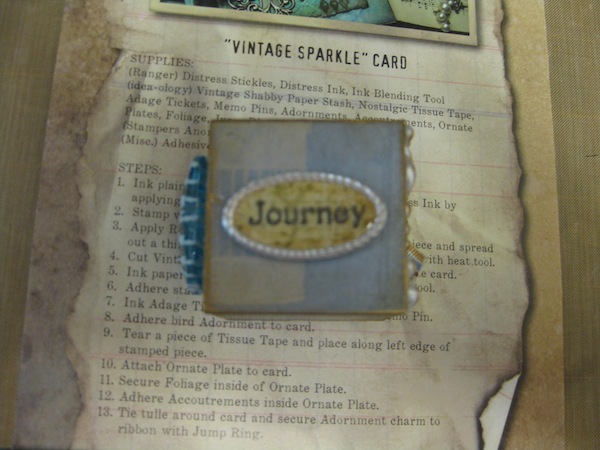 This is a “journey” into my creative side and where it will lead is anyone’s guess. A lot of the photos are out of focus, sorry. Trying to get these little things in focus was a trial unto itself. The last side of the first block is a giant glass bead. 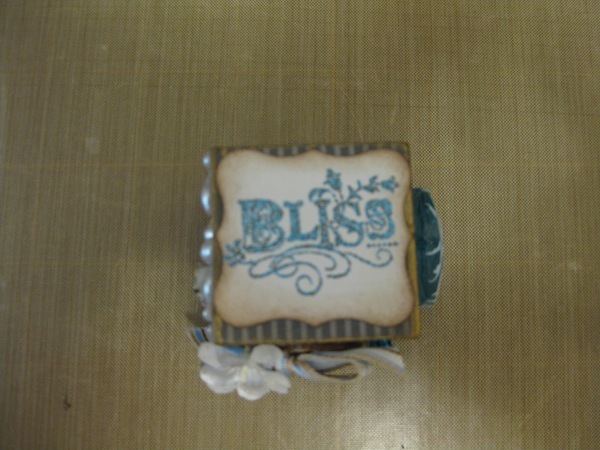 The top of the block I have used an image from the Stampin’ Up! set “Bliss”. It was a Sale-A-Bration set from last year or the year before. 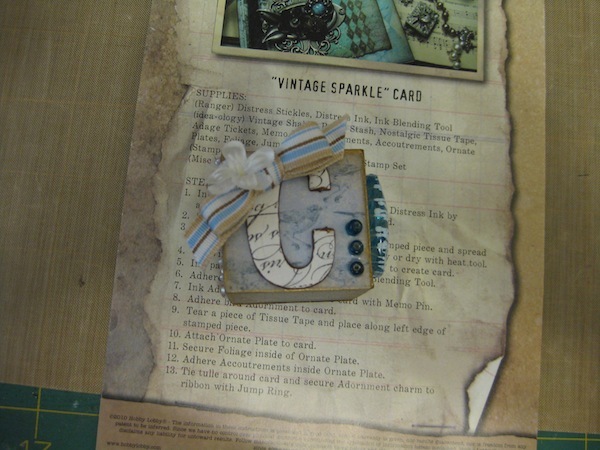 I’ve used some turquoise embossing powder from Personal Stamp Exchange which I bought on eBay a long time ago. 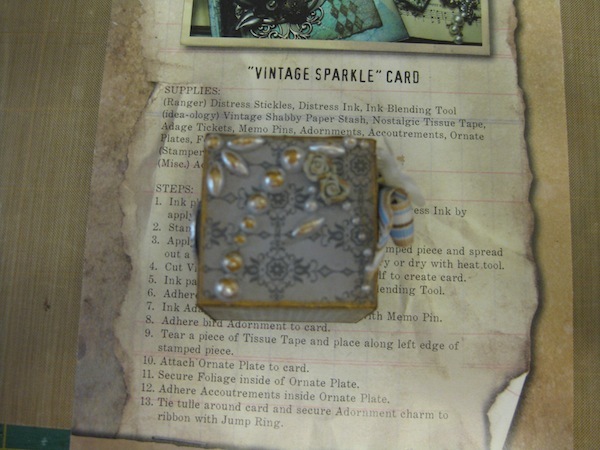 I’ve also used a punch from Stampin’ Up! I don’t remember the name of it. Curly label or Designer label. One of the two. Next is the block with the letter “R”. I put a couple of feathers behind the letter and a gold plastic button next to the letter. 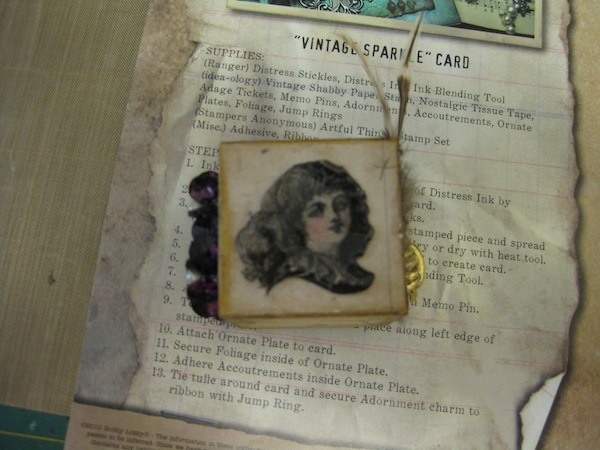 I have a booklet with vintage images to be cut out. 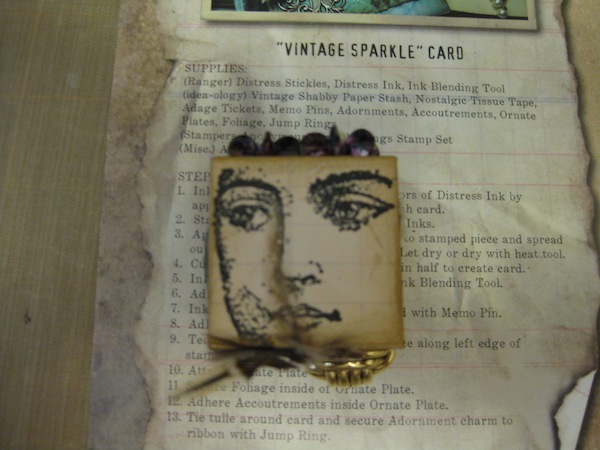 Which I did then covered the image with VersaMark ink and poured over it with clear embossing powder. I heated it to melt the powder, then while it was still hot I dipped it into more of the embossing powder. I did this about four times to get a very glossy effect. Then I adhered the image to the side of the block. 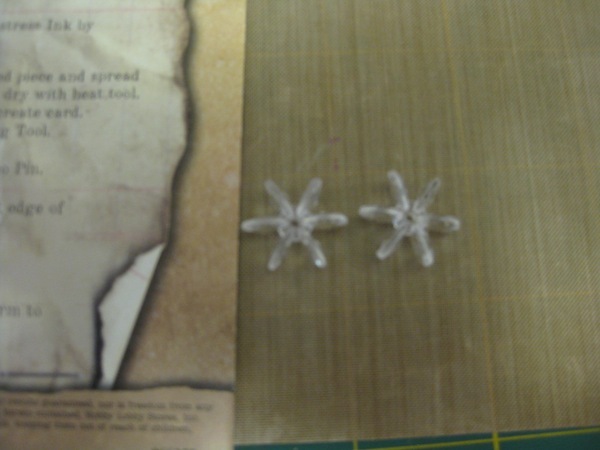 I played with some clear star bead things I have. These things are kind of difficult to know what to do with. They are large and just plain strange. I don’t even know why I bought them other than the fact they are shiny. Looney tunes I am sometimes. I’ve used alcohol ink to change the color of the plastic star bead things then added a yellow pearl to the centers. The result is something I’m not quite sure I like. I do like the fact that they take the color of alcohol ink well. It sure does make them stand out. 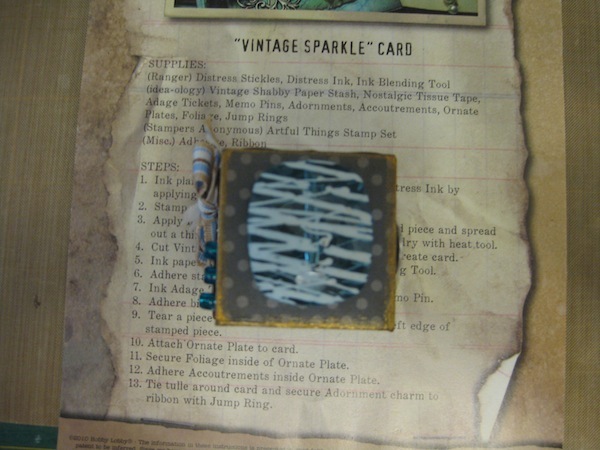 The last side of the block I played with some of my new Nestabilities purchased from Hobby Lobby the beginning of this month. I cut out a piece of paper with the dictionary word “Believe” then cut out a dark brown scalloped edge matte from another of the Nestabilities . The dark brown just barely peeks out from behind the front image and I find I like this. 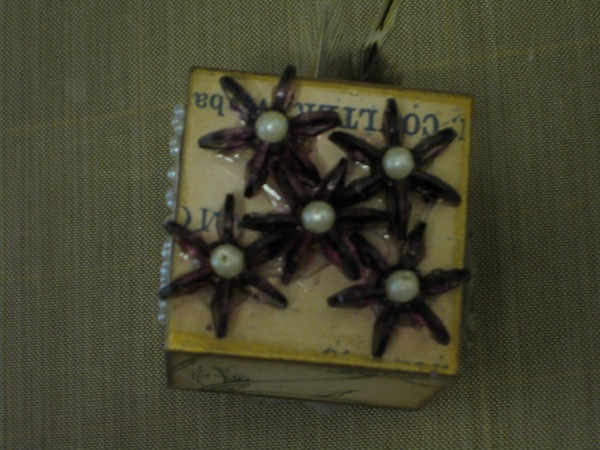 I’ve also added some more half back pearls that were parts of a great big flourish. I’m just not in tuned with my feminine side enough to enjoy playing with pearls. 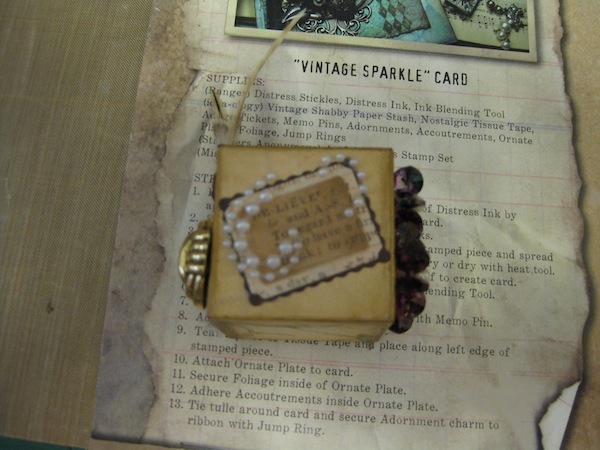 The top of the second block I used a stamp I purchase from Michaels a long time ago. I really like the face this stamp makes. I used black Staz On ink to stamp the image. Open more than doors 🙂 They open your mind for crafting opportunities. 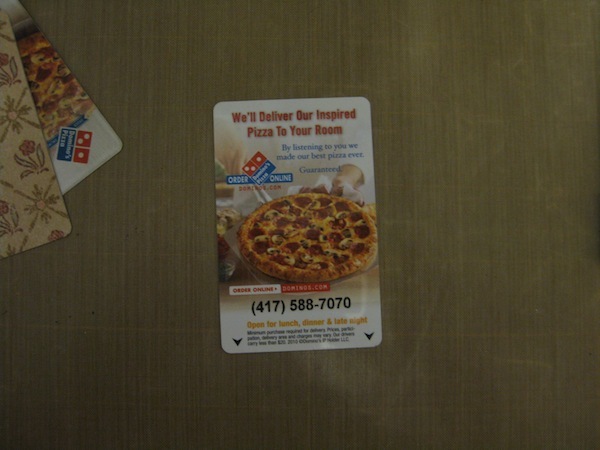 There was a major scare several years back about your personal information being placed on the magnetic strip of motel/hotel room keys. Your name, address, and credit card information. When we first heard this our paranoia kicked in and we didn’t turn the keys back to the front desk at check out. Instead we brought them home to be shredded. Over the years an idea had been trickling around in my head. Today, really yesterday, that idea finally made it out of my head and into a craft project. 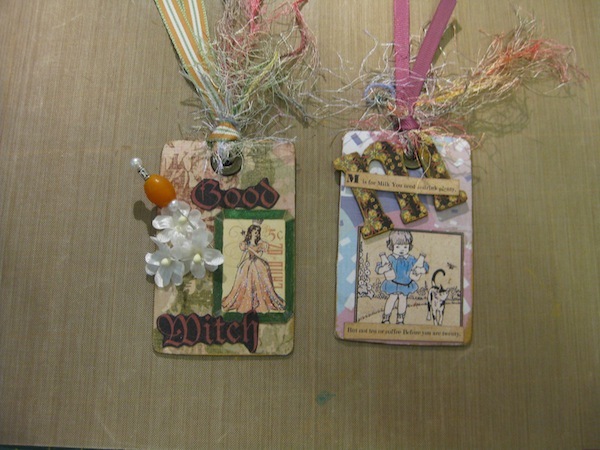 You can watch the video tutorial I made to create these tags. If you have a key or two in a junk drawer or laying around on a table or desk you might want to give this a try.